The magic of Apple Holler actually started thousands of years ago with the sun rising over the Great Lakes and the rich soil created by the mighty glacier. It’s the pristine water from the ancient Inland Sea and the magic and excitement in the air on warm summer days and crisp autumn nights. It’s in the simple joy of childhood and savoring the present moment with those who matter most to you. In telling you “the Apple Holler story,” we hope that you will get a little taste of the age-old tradition and magic that make our family farm so special. At our family farm, enjoy a day of growing at the farm, from picking in the orchard to tasting at our restaurant’s farm table or by bringing our products home to your table. We want your time here to be spent making memories. Join us at Apple Holler and experience the magic of apples. We will hire the most qualified people we can find. We will support our employees’ development both within and outside our company. We believe that only a happy and professional staff can give the level of personal service that we demand. We see an investment in people to be a worthy investment in the future of Apple Holler. We will consistently deliver our service guarantee that every guest will leave Apple Holler feeling better than when they arrived. We will provide outstanding service – the kind of unique and personal care that our guests will tell their family and friends about. We will support worthy charities with money, resources, and volunteers. We will be environmentally responsible. We will recycle, conserve water, and reduce our use of chemicals. Whenever possible, we will select suppliers who are environmentally friendly. We will create a trusting relationship with our staff. In this atmosphere, we can work out difficulties and make decisions together. People come to Apple Holler to have a good time. We want each guest to enjoy their experience at Apple Holler so much that they can’t wait to tell their friends and family about it. 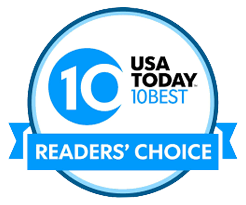 Apple Holler is proud to have been voted one of “Top 10 Best Orchards” in the country in the September, 2015 USA Today “Top Best” contest. This was our first time to your restaurant. We have lived in southeast Wisconsin for a long time and never took the time to get off the highway and give it a try. We were pleasantly surprised and will definitely be back. Our Easter buffet meal was excellent. The prime rib was very tender and tasty. There was a large selection of items, and all items were refreshed often. Apple Holler does an excellent job of providing great service for a holiday meal. I really enjoyed our lunch at Apple Holler, as I usually do. I have never been disappointed with service or the food. All the servers have always been pleasant and attentive to our wants. Keep up the good work and I will keep on coming back happy. What an adorable place! I think this is definitely a beautiful hidden treasure here in WI. ? I’ll definitely be back. Our family and guests come here a lot. We love the quality and diversity of food items, love the cozy atmosphere and the gift shops! The food is great but the people are outstanding. Thank you for always making these events so special.